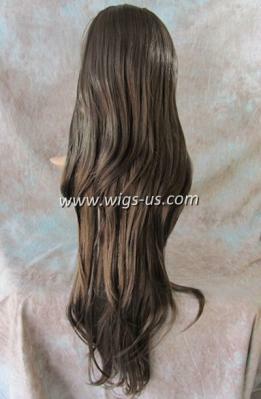 Donata ¾ by Wig America ~ Owning 36 inches of hair can be daunting. What are you going to do with it all? How are you going to style it? These questions and many more now become your persona; playground to experiment with whenever you want. When you own the Donata ¾ wig, you have beautiful long layers of hair whenever you need them. Wearing the ¾ cap allows you to incorporate your own hair into the mix if you'd like, or you can always wear a headband/scarf as well. By using your own hairline though you create a natural look that can not be overlooked. Attaching a ¾ wig is a simple process in itself. Using two flexi combs, you simply place it on like any other wig and it will provide you with a secure fit you can feel comfortable wearing at all times. As part of the Mona Lisa Collection, the Donata ¾ is a luxury to own. 36 inches of hair! We though we'd repeat the number, as if the image doesn't say enough. Own this long layered wig today, and have fun with all the styling possibilities you dream up along the way. Use your own hair or a scarf in front. Secure the wig with the 2 flexi combs.